You may be a real tactical genius, but if your enemies are led by a bunch of filthy Jedi it’s going to be tough to put up a fight unless you’re also gifted in the Force. And since there’s not a lot you can do about your midichlorians at this point, you might be feeling a little down in the dumps. But don’t give up! At least not until you’ve given General Grievous’ gambit a shot. Because a master strategist never admits defeat: he’s always thinking of another way to get back at his enemies. If you can’t beat them, join them, he says to himself. And if you can’t join them, start adding cybernetic enhancements until you’ve leveled the playing field! It’s not a path for the faint of heart (or those who are particularly fond of their own kidneys), but it gets the job done—most of the time. Don’t believe us? Just take a look at Grievous’ extensive lightsaber collection! But unless you already have a secret lair where you can store all of your spare parts and stop in for maintenance, becoming a cyborg is going to be quite an investment. 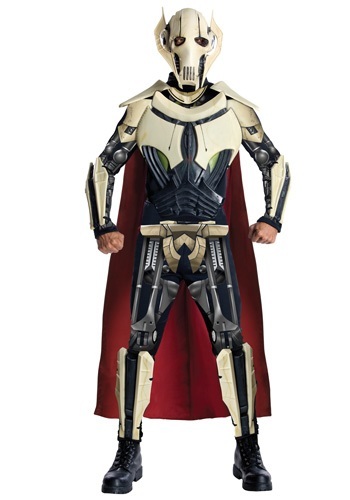 If you simply want to see how you’d look under the grim facade of this menacing general’s body armor, however, why not try on this Deluxe General Grievous Costume? Decked out in its realistic polyfoam plating, you’ll feel strong enough take on a Jedi Master and cool enough to exploit the Clone Army's unseen weaknesses!